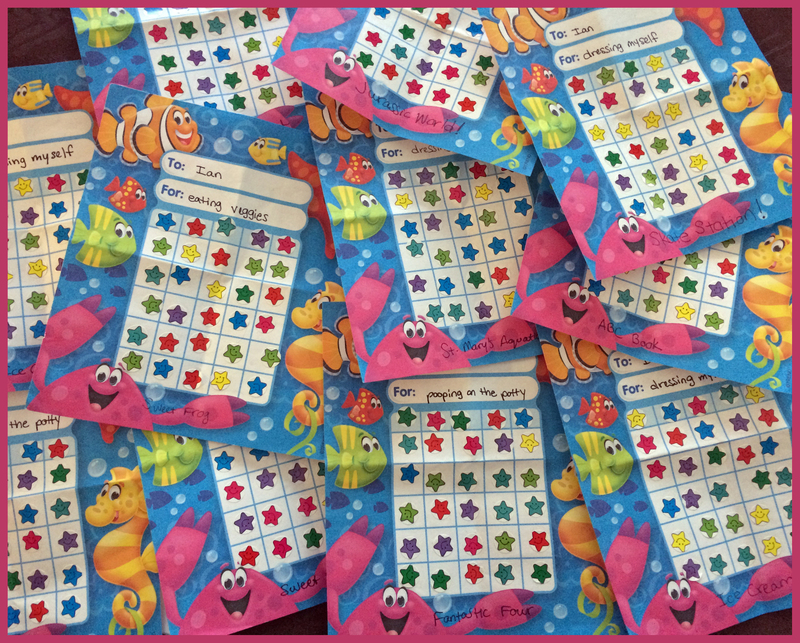 Schedules and Sticker Charts – Success! Educators of young children know that children love structure. Sometimes, parents are fortunate enough to know this, too. 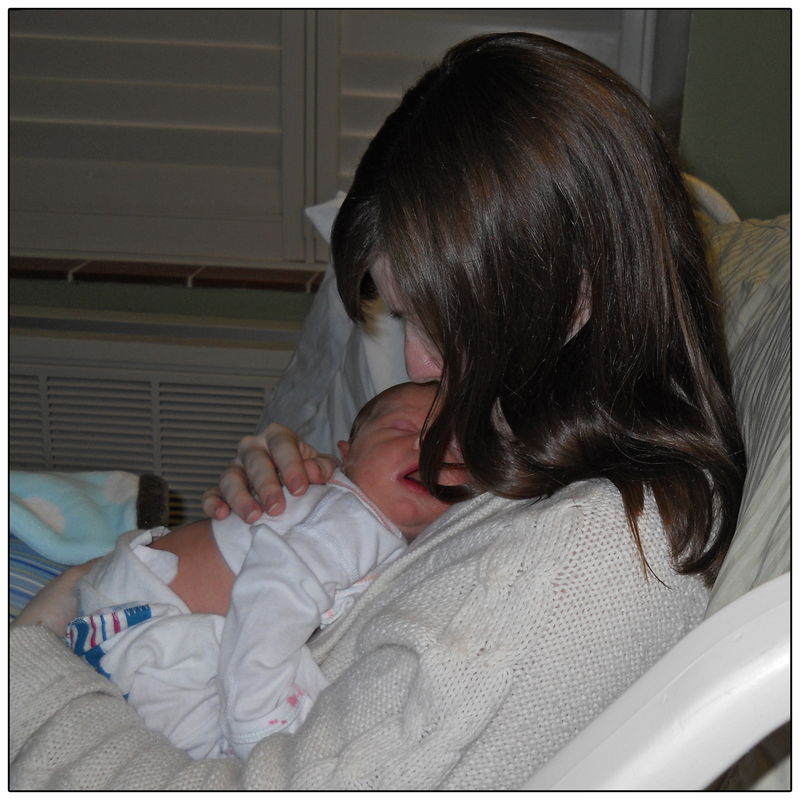 I have my sister-in-law to thank for giving me On Becoming Baby Wise when I was pregnant with Peter eight years ago (read my review here). My first son was born with a compliant disposition, and since he didn’t have any competition in the sibling department until he was four, it was easy to build structure into his daily life by following Babywise‘s suggestions. By age three, he had been fully potty-trained for a while and was fairly independent. When Peter started preschool, the only thing I worried about was me surviving a much earlier wake-up time. Everything changed with baby number two. I tried so hard to implement the same structure into Ian’s life as Peter’s, but there were two major stumbling blocks in the way of achieving this goal. The first is that when Ian came along, Peter didn’t just disappear; I am now a mom of two. Second, Ian is a completely different animal than his brother – strong-willed (he’ll touch the stove even when he knows it’s hot), mischievous (he’ll pull on the oven door just to find out what it does), clumsy (he’ll walk into the kitchen and fall flat on his face – right when I’m opening the oven door)– and did I mention strong-willed? I feared Ian was developmentally delayed or somewhere low on the autistic spectrum (jury’s still out on both of these – trying to get an appointment with the only local developmental pediatrician has been harder than I imagined). Last spring, I started talking to the woman I hoped would be Ian’s teacher about his potty training issues and my worries about his behavior. She had also taught Peter and seemed alarmed to hear about Ian’s issues, but she was more than willing to advise me. To encourage Ian to be independent, as far as the potty is concerned, she told me to use incentives, rewards. As for his social behavior, she suggested structuring his day as much as possible. He had to learn to deal with interruptions in the middle of an activity he was enjoying without throwing a fit. I was stressed over not being able to prepare him in time for the first day of school. I dreaded being in the middle of teaching my own class and getting a phone call that Ian had already messed up all three of his outfits. Or if that wasn’t the problem, he would disrupt class, push other children, fail to follow the rules, scream at the drop of a hat… he would be the nightmare student that no one wants to have. It was June. I had two months. Fortunately, at the end of twelve months of potty training hell (read the account of the first nine months here), Ian was bowel trained the same day we solved a dietary issue – we got him on a magnesium supplement. The new issue was getting him to dress himself before leaving the bathroom. (I honestly don’t ever remember teaching Peter how to get dressed, other than how to tell his right shoe from his left – it was a total non-issue.) Obviously, it wouldn’t do for Ian take himself to the bathroom but not know how to pull his pants up again. It’s baby steps, folks, and with this child, each step seems to take about a decade. These signs have Velcro on the back. My preschool class inherited the ones above from the kindergarten teacher who was in our room before, and we can move the components around every day. My four-year-old students actually pay attention to this schedule and depend on it to tell them about their day. I wanted to find something similar (but portable) for Ian. Lo and behold – I found an Easy Daysies magnetic board with all sorts of optional magnetic schedule categories on the clearance table. 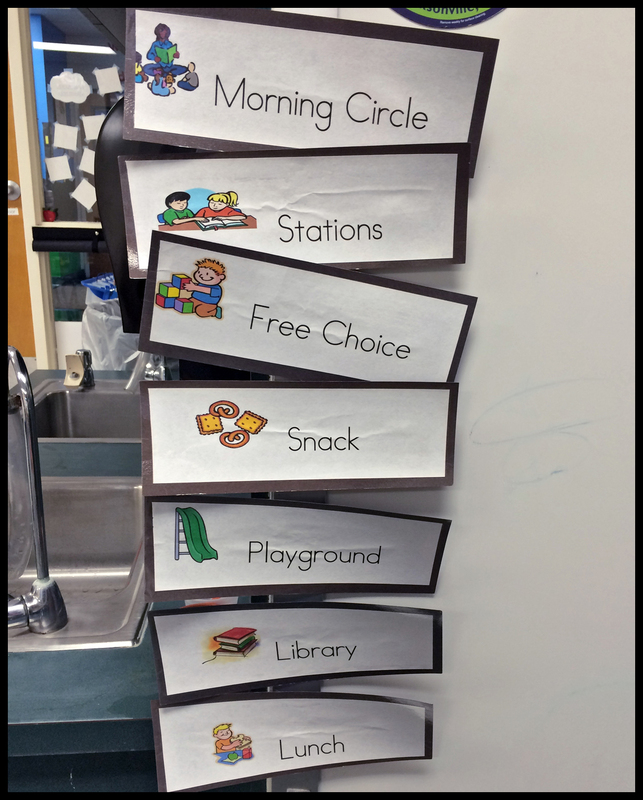 I picked up the standard daily schedule (most of the magnets on the picture below are from this collection), as well as a set geared toward extracurricular activities like sports and dance and gymnastics – even one set that’s all about potty training. Between the school supply store and the local dollar store, I picked up a number of activities that I knew Ian would enjoy – foam alphabet puzzles, coloring books, stickers. I even filled a shoebox with scrap paper that he practices cutting. After buying all the supplies on a Saturday, I started “summer homeschool” the next Monday. I introduced Ian to songs I knew he would sing in PreK 3. I drew his attention to the new magnetic schedule. I awarded him with a sticker when he pulled his pants up by himself. Sticker Charts! This kid has earned a bunch of rewards. The transformation was amazing. It’s not like he’s morphed into a different person – he hasn’t turned into a miniature version of his brother – but he’s gained patience, is able to sit at an activity for an extended period, has an expanded vocabulary, and is even – gasp! – more compliant. 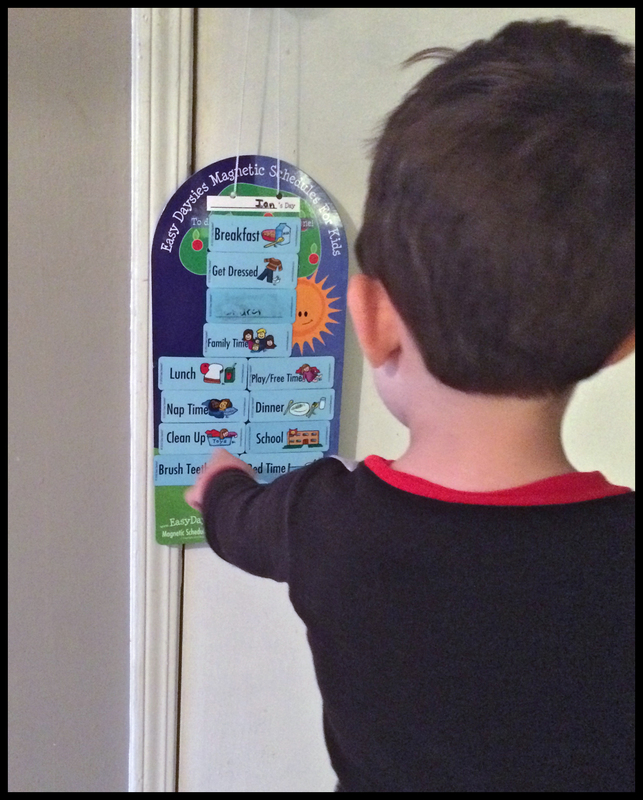 Although Ian loves his sticker charts (and earns some sort of reward every time he fills one up), he loves the schedule even more. He has to check it several times a day. Even though there are many days when nothing special happens, he reads it eagerly, reciting, “Naptime, suppertime, clean up time, brush teeth time, bedtime.” He is even willing to go right to bed when the schedule dictates. Maybe you don’t think that’s miraculous, but it certainly feels that way to me. Even Peter has gotten onto to schedule/sticker bandwagon. I picked up a whiteboard for him. 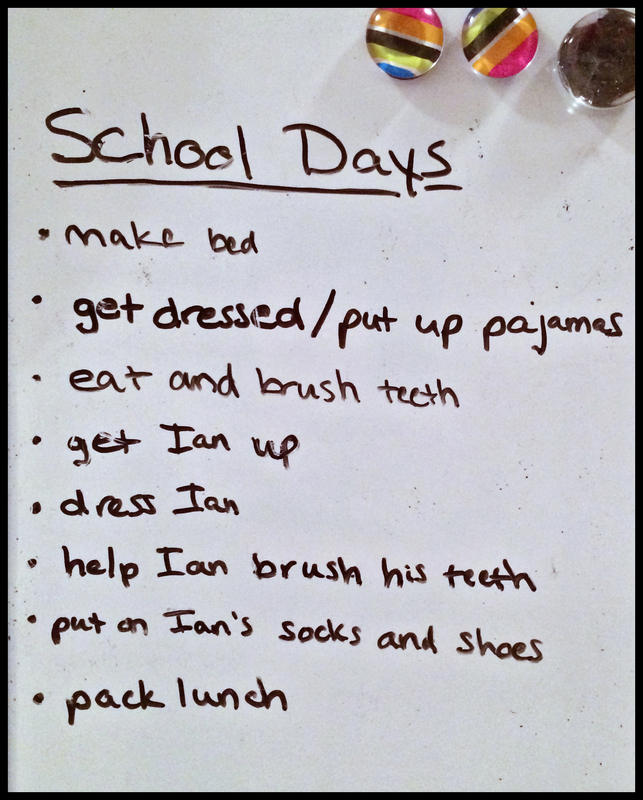 Over the summer, I wrote his daily chores, and now, I have a list of his morning chores. If he completes everything on the list before we leave, he gets a sticker, which equals a dollar. If he leaves his pajamas on the floor or doesn’t make his bed, for instance, his forgoes the sticker and money. My house is a different place. It’s still messier than I’d like, and it’s certainly far from peaceful at times, but a lot of the pressure that I used to feel – to be perfect, to do it all myself, you name it – is gone. It’s only natural, you say – my kids are growing up. Yeah, that’s true. And maybe I just happened to start implementing these plans at the time when my kids were ready for them anyway. Doesn’t matter – my house is a good place to be. It’s a place where I can entrust at least one child with some responsibility and in which I’m watching the other grow into his own little personality. And, as always, even when a mishap happens, it’s all fodder for a good story. There is a reason On Becoming Baby Wise: Giving Your Infant the Gift of Nighttime Sleep is my favorite gift to give new parents; it is the number one parenting book in my own collection. Authors Gary Ezzo and Dr. Robert Bucknam not only offer advice on how to get infants to sleep through the night, but they also cover a wide range of issues from how to raise multiples to what to do about colicky and reflux babies to fitting baby in with an older sibling or siblings to which baby products to buy and beyond. I was very skeptical when a family member recommended Babywise, but she swore that it was the main reason all of her babies slept through the night by eight weeks. I had many other books in my maternity collection, but even the book that was specifically about breastfeeding didn’t give me nearly as helpful advice as Babywise did about the pros and cons of breast versus bottle, when to feed, and most importantly, why to feed (or not feed) at certain times. Both of my sons had colic and reflux. Not only is there a chapter dedicated to these specific issues, but it also encourages parents like me to stay on the Babywise plan, with necessary modifications. Instead of giving up because my children had a few early problems, sticking with it helped them regulate and sleep through the night at seven and eight weeks, respectively. So what is it that Babywise recommends? It’s called parent-directed feeding (PDF). Someone asked me, “Is it one of those books where it tells you not to feed your baby?” Absolutely not! Rather, it teaches parents how to recognize when the baby actually needs nourishment versus a diaper change or some other form of care. Just because the baby cries doesn’t mean he needs the breast or bottle, in other words. Many people of the attachment persuasion are opposed to this method, but think of it this way: You wouldn’t eat when you had a stomach ache or just needed to get some rest, so why would you put food in your baby’s upset tummy or try to pacify him by nursing when what he really needs is a nap? Ezzo and Bucknam explore the history of parenting theories and explain the extremes of hyperscheduling (the baby must eat every X hours—no flexibility!) to no schedule at all. PDF is a happy medium, creating a predictable, flexible routine, which babies and children crave. They will be happy, well-rested, self-assured babies with equally well-rested and satisfied parents.